Sharin Apostolou as Florida Fandango. Photo credit: Teresa Castracane. 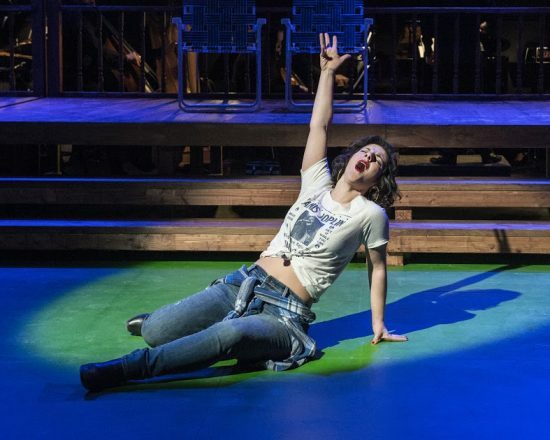 Saturday night marked the world premiere of new American opera “Florida,” a darkly comedic drama that explores a young woman’s coming of age and the stigma placed upon her sexuality by the community. This chamber work is a first-time partnership between composer Randall Eng and librettist Donna Di Novelli, whose fusion of opera, musical theater and jazz styles create a unique soundscape that equally conveys both Florida’s red-hot passion and her tragic loss. The setting is suburban America. Crop tops and cigarettes set sixteen-year-old Florida Fandango and her mother apart from to their nosy neighbors, the Redwoods, who are the very picture of a quintessential four-person American household complete with a backyard deck, lawn chairs, and color-coordinated outfits. When her mother decides to send her away for the summer, Florida chooses to leave despite her boyfriend Marc’s protests and see what else the world has in store for her. Marc’s infatuation with Florida soon turns into an obsession that incites him to murder her mother for keeping Florida from him. Wrongfully accused of seducing Marc into committing her mother’s murder, Florida faces the consequences of being deemed too sexual for her own good. Sharin Apostolou as Florida is positively sensational in her captivating portrayal of the young girl’s lust for life and experiential coming of age. From her sensual physicality to the ease of her vocal production, Apostolou’s high energy performance leads the show with an intensity that matched that of her complex character. The same cannot be said of the entire cast, however, most of whom seemed to struggle in their attempts to navigate the challenge of the quick shifts in singing styles as presented in Eng’s score. Several vocal standouts included bass-baritone Ethan Greene as Redwood Male and tenor Ian McEuen as Redwood Son, both of whom I should like to hear more from in future Urban Arias productions. In the second act climactic number “Readily Available,” Daniel Rowan as the devious boyfriend Marc was finally able to utilize the full strength of his musical theater belt, which brought down the house. Nancy Allen Lundy also deserves praise for her sultry, yet comedic interpretation of One Dead Mother most notably during her never-ending autopsy scenes. After observing One Dead Mother, one can only guess where Florida developed her ideas of style and seduction. As expected of a chamber opera, the set design by Andrew Boyce, is minimal yet effective. Bright green “grass” covers the stage floor except for a walkway up to a miniature version of Florida’s white house with a red shingle roof. The Redwood’s home-built deck provides multiple levels that move about interchangeably to form new backdrops for various scenes. Also in compliment to the visuals is Abigail Hoke-Brady’s striking lighting design that further reinforces the spatial flexibility of the black box theater as the scenes quickly transition between moonlight and harsh hospital fluorescents. The Inscape Chamber Orchestra, under the baton of Robert Wood, triumphed in their interpretation of this eclectic score. Their sensitive playing added nuance to the more internal moments and brought to life the electrifying dance and jazz rhythms, creating seamless shifts between movements despite the score’s frequent abrupt transitions. Overall, Urban Arias production of “Florida” is characteristically striking and worth going to see just for Sharin Apostolou, however the audible difficulty most of the singers had trying to effectively sing this fusion of musical styles coupled with the choppy musical progression hurts the desired feeling for completeness at the end of the show. Despite these shortcomings, “Florida” remains a strong addition to Urban Arias’ repertoire due to the challenging yet relevant themes it poses of how today’s society perceives a woman’s sexuality. No matter if you love it or leave it, “Florida” will leave you thinking. Running Time: 110 minutes long including intermission; an audience talk-back will follow each performance. Advisory: Florida contains mature references, and may not be suitable for young children. “Florida” is playing at Atlas Performing Arts Center in Washington, D.C. through April 14th, 2018. For tickets or more information, click here.